I've been interviewing a number of candidates for our team recently. 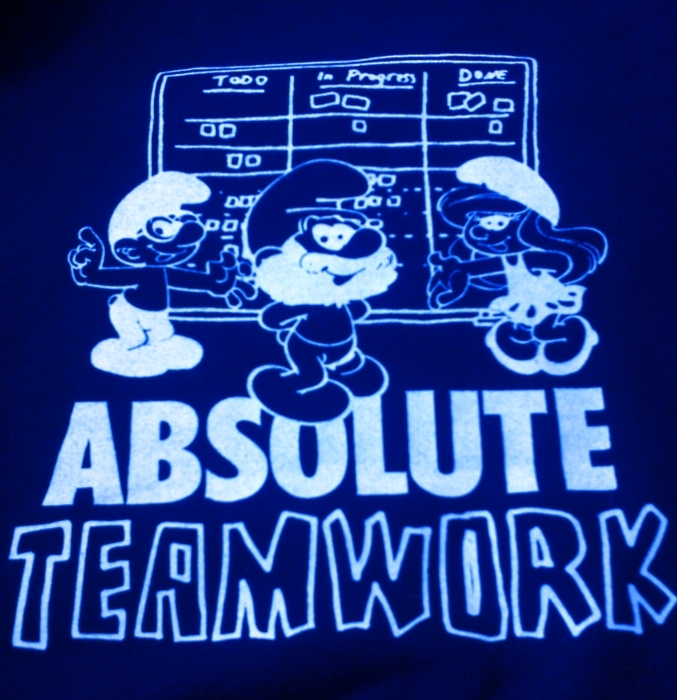 Almost every CV contains some pseudo-mandatory clause about great teamwork skills. I was wondering what teamwork meant for these people. So I asked. Too often, it doesn't sound much like a team. 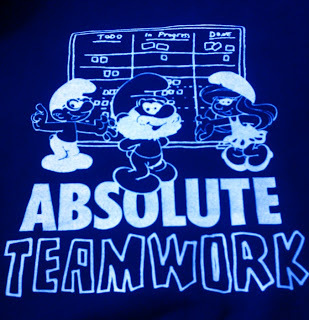 My reference for the concept "teamwork" in the past year and a half is a team called "the Smurfs". I was fortunate to have served as their scrum master for a few months when the team was forming after joining two teams together, and held a management role throughout the long project. The team has a distinct culture of asking each other for help and being immediately available to provide help. It's essential for doing peer code reviews, for getting new team members on board and for knowledge sharing. A special role of an "on duty smurf", a fire fighter dealing with customer issues and test failures for a whole sprint, allowing the rest more focus, is unlikely to have been possible without this helpful spirit. The team continuously demonstrated respect for each other. One aspect of it is that being passionate about the work led to passionate discussions. These were not ego driven, "my idea is better than yours" type of discussions, but rather real exchange that actually included listening. I could see it in technical design discussions, and in retrospectives alike. It all boils down to safety and trust. Without a sense of being trusted, people are less likely to help or ask for help, and to experiment individually and as a team. Last, but not least: fantastic results! Besides the dramatic improvement in the response time to customer issues, the improved test coverage (quantity and quality increased), and quality - a new and exciting set of features, nicely balancing highly sophisticated capabilities with a rather straight forward user experience. I'd like to acknowledge and thank the individuals who demonstrated to me what's teamwork. Dganit Keidar, Gad Salner, Ichai Luzon, Idan Zohar, Marwan Jaber, Michael Adada, Oded Nehama, Ofir Laviad, Ortal Balter, Rosalind Eidelheit and Yaniv Mualem. Strongly affiliated and supportive of this team, locally: Assaf Appel who served as the Product Owner, Gadi Benedek, Asaf Broide and Lior Yaffe, together with a good number of people from the administrative staff. From Germany, we enjoyed the further support and collaboration with Andreas Goermer and Oguzhan Oezkut. And speaking of safety and trust, there's a big doubt if things would look the same without Christian Gengenbach, our VP. The Smurfs continue to their next project in a different format. I'm certain they won't settle for anything less. As the lazy smurf avatar holder, I would like to thank you guy for being such a good scrum coach, the mentality you have and the team shares is the main reason of success. The vision of the management and their understanding of the responsibility process made it easy for us to work our way.